Writing about the Holy Prophet (PBUH) of Islam is a gigantic undertaking. I must confess that I am neither a scholar, nor have I studied Islam for a great many years, so every single statement I make comes with the limitation of one who has great love, but is still lacking in great subject knowledge, and indeed in correct expression at times. The main reason I am undertaking this article is because it is through the personality of the Prophet (PBUH) that I found Islam, and in particular through recognising him as an embodiment of all those attributes that we associate with “good”. As I had misconceptions about why he had so many wives, it was striking that it was my revised understanding of the relationship with his wives that made me embrace Islam. If I succeed in communicating to the reader the exemplary, infallible character of the Holy Prophet, and thus the most special person in the history of Islam, this undertaking is worthwhile. I hope to shed some light on the significance of his taking several wives and indeed the love he shared in his marriages. Lady Khadijah used her great wealth after her marriage to the Prophet to assist him to promulgate Islam, and she sacrificed all her wealth for this, without ever complaining about the privations of her new life. Fifteen years into their marriage, when the Prophet (PBUH) was aged 40, and she was 55, his Prophethood started. Lady Khadijah bore him 1 children, of whom Fatima Zahra would go on to marry the Prophet’s cousin, Ali Ibn Abi Talib (PBUH). The fruit of this union would be the Prophet’s grandchildren, the Second Imam, Imam Hassan, and his brother, the Third Imam, Imam Hussain, as well as their sister Lady Zeinab. 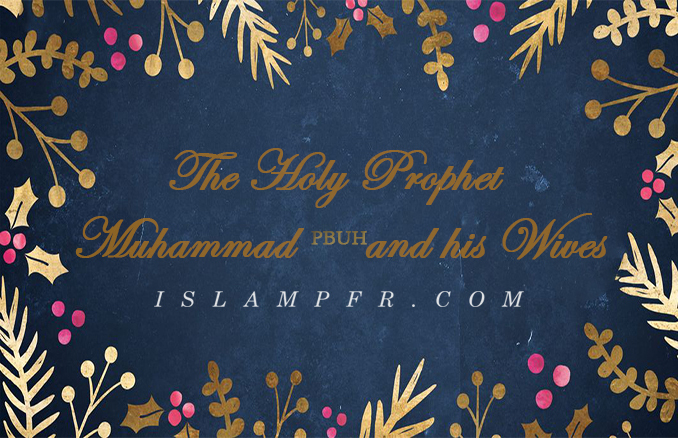 The Holy Prophet (PBUH) was 50 when she died at 65 years of age, and in their 25 years of marriage she was the only woman he married. The marriage of the Prophet to Khadijah serves as an example to all married couples on how to conduct themselves. The wives of the Holy Prophet had a role to play during the Prophethood. In the history of Islam, the role of women in the promulgation of the faith is significant, as are the traditions of them being witness to significant decisions. Shias and Sunnis have in continuous narrations, mentioned that the first man (male) to believe in the holy religion of Islam was Ali Ibn Abi Talib (PBUH), and the first female was Lady Khadijah (PBUH). (Hayat Al-Qulub) As was already mentioned, she was a great support to her husband in the early days of spreading the message of Islam. The Holy Prophet said to Umm Salma (in presence of Ali Ibn Abi Talib): “O Umm Salma, listen to this and be a witness that Ali Ibn Abi Talib (PBUH) is my Vizier in the world and the hereafter.” (Hayat Al-Qulub) This is a significant message, and the Prophet delivers it with his Umm Salma, his second wife, as a witness. “When Mohammed Mustafa (may God bless him and his progeny) died in 632, he had nine wives in his harem.” (A Restatement of the History of Islam and Muslims) This is a fact which is often misunderstood by the West; having more than one wife is not common practice in the West, indeed is generally illegal to do so. Considering that several of these wives were widows, or had been divorced, there is obviously a different motivation at play here. “All the wives of the Holy Prophet except Ummu’l – Mu’minin Khadijah are of equal rank.” (Peshawar Nights) There were also two special slave girls whom the Holy Prophet did not marry though. One of these two slave girls was Mariya, the only woman except for Khadijah who bore him children; she gave birth to Ibrahim, however, the child died in his first year of life. Only one of his wives was a virgin when he married her. As everything has a purpose, there is a purpose to the Prophet taking widows and divorced women for wives, as well as captives to whom he restores their freedom. What qualities should one look for in a spouse? What are the standards of behavior expected from spouses?